The summer I turned 13 my friends and I would often spend our Saturdays by jumping on a bus and heading down to Chinatown in Washington DC. We would go to catch the 12 hour Martial Arts movie marathons that frequented DCs Chinatown theaters. Once the bus let us off and hopefully before the movies started we would work our way through the little shops that carried a curious jumble of all things Asian. Among their wares they would stock apothecary supplies, Asian works of art, clothing, piles of Shark fins, Chinese pottery, cotton soled shoes, incense – you name it, but most importantly they carried a giant selection of Martial Arts supplies. We got to handle steel chain dart whips, throwing stars, three section staffs, nun chucks, uniforms, sashes, real tiger balm (to make you hands hard as iron! ), and books on every exotic Martial Art under the sun. We of course touched everything at least once, dreaming of the day we would be martial arts masters. One of the Chinese shop owners would sometimes give us small demonstrations in the Kungfu School he ran next to his shop on how a certain weapon might be used (and point out the appropriate book to purchase along with it). He was absolutely amazing to watch in action. We would ask him to teach us some small move to get us started but in his broken English he would tell us that the Secret was in the book or in Class. So we gave him our yard cutting money and purchased staffs, nun chucks, darts, any number of Martial Arts gizmos as well as the appropriate books and apparel. We spent many an hour that summer tossing throwing stars into trees, accidently bonking ourselves in the heads with nun chucks and generally playing at be Martial Artist. I can honestly say that those were some of the best days of my life and though our parents found and confiscated our goods, there was something truly magical about the experience. None of us ever got very good at using any of these elusive Martial Gizmos. And we all knew why – there were Secrets to using them that just were not taught in the books and none of us were willing to give up the movies for a 2 pm Kungfu class on a Saturday afternoon. So we continued going to the movies and dreamed about being Martial Arts masters. The other night we were practicing a cross wrist grab escape, Ichibai tekubi uke. I love this te waza for several reasons. First it contains in a clearly demonstrative fashion the elemental sustenance of Jukido Jujitsu and the role that each part plays in all our waza. Kuzushi – creating or leverage momentums and the homeostatic nature of human biology and aggression. 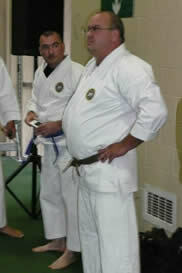 Shorinji – manipulating the inherent momentums of Kuzushi – taking advantage of Newton’s First and Third Laws of motion. Jushin – framing the waza in the most advantageous physical metric allowing for the least amount of applied energy and the greatest return on investment. From my point of view he seemed to be doing a great job with the technique given his rank but putting myself in his shoes I can understand why it seemed like he wasn’t taught the secret even though our Sensei had stopped the class several times to give general corrections and had meticulously gone over the core concepts with the class as a whole. I would have liked to save him a lot of time and point him in the right direction by stopping and pointing to the sign in the Dojo that states in Japanese “Shut up and Train” and tell him The Secret is – There is no Secret – Shut up and Train and the rest will follow. It may sound anticlimactic but if I learned nothing else its – that is the secret – there is no secret – just training and diligence. The Chinese man that sold the Martial Arts supplies tried to tell me that when I was a kid but I was sure there was a short cut. So here I am 32 years later and I can tell you – I never found a short cut until I started to train on a regular basis. If you want to be a good Martial Artist you must train to be one. You must attend class as your schedule allows, you must train on your own. 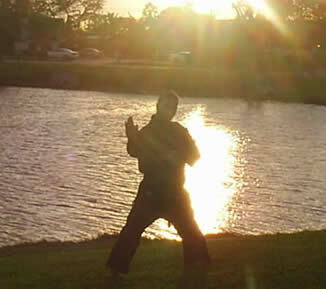 You must think of yourself asa Martial Artist and then live up to that vision. I would go further by sighting my own experience with Jukido by saying that although you’re Sensei can guide your daily training régime he cannot hold your hand and encourage you outside the Dojo. You must take personal responsibility for your training and act accordingly if you intend to progress. A few weeks ago, late at night I was practicing Kata under the street lights of the parking lot at the school across the street from my house. It’s a great place to go and practice kata. Isolated, flat, clean – a small pound to look at, trees and all the room I could possibly need. During my third or fourth set it had started to rain a little – I love the rain – I thought to myself, “I hope at 80 I’m still able to do this” and it occurred to me that even as I spoke, some place there was an 80 year old man practicing kata – maybe in the rain – at that exact moment. I came to the realization that the circle of budo as a tradition and art was timeless and I was just one budoka in the long line of practitioners that had come before me. That many people had chosen to simply “shut up and train” and that this choice, once taken to heart, was what separated them from the students who had started and for one reason or another stop. I imagined my 80 year old counterpart having gone through many of the struggles we all go through, the ups and downs of life and in the end he was still standing, working on his retraction and trying to ignore the pain in his left knee. Ossu!